R MacFarlane Cameron, dated 1896 with probable earlier fabric to rear. 2-storey, 3-bay, roughly L-plan, Scots Baronial commercial building with central crow-stepped gable with wheat-sheaf finial. Snecked, rock-faced cream sandstone with polished red sandstone ashlar margins and at ground. Rubble to side and rear. Roll-moulded surrounds. Moulded cill course, eaves course. Segmental-arched openings to ground. Round-arched pediments to dormerheads. Wing to rear with late 20th century projecting stair tower at W.
N (street) elevation: symmetrical. Central pair of 2-leaf, 6-panel entrance doors with tall fanlights above. Central date plaque above with intertwined initials J and T (see Notes). Strapwork pediment to central 1st storey window with monogram RMC. Variety of timber framed fenestration. Timber framed, 6-pane over plate glass to 1st floor with opening upperlights. 3-light over plate glass to ground with dentilled transom. Grey slates, deep skews. Coped gable stack. Cast iron rainwater goods. INTERIOR: not seen 2007, but believed to be substantially altered. 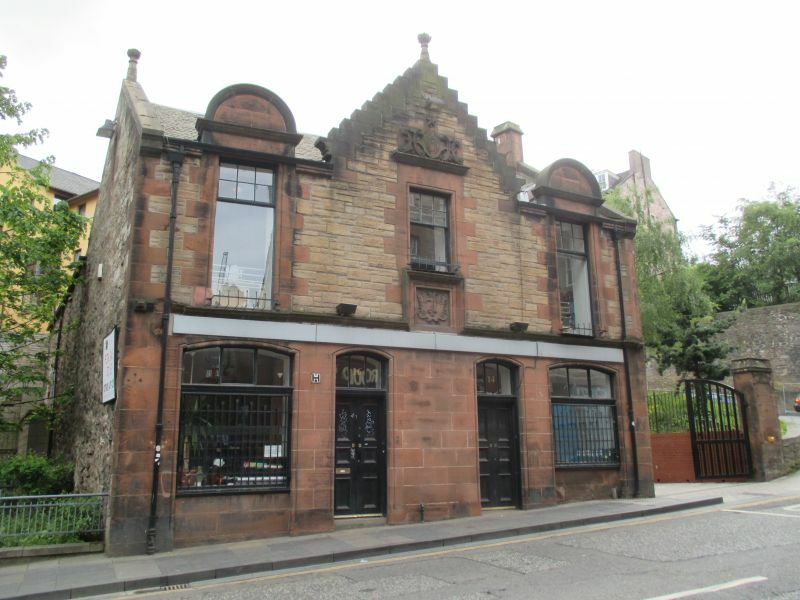 This is a notable example of a well-detailed late 19th century minor commercial building by a prominent Edinburgh architect. It is the only 19th century survivor in a comprehensively redeveloped area south of Holyrood Road and is of significant streetscape value. The building was built for its owner James Tait whose initials are carved on the plaque at 1st storey level. This carving is typical of carvings by Cameron, who was also responsible for the tenement at No 9 opposite (see separate listing). In the 1890s, it appears that a campaign to widen the South Back of Canongate involved the demolition of a number of buildings and Nos 14-16 was rebuilt on a new line. Most of the rear of the building is likely to date to at least the early 19th century. Robert Macfarlane Cameron (circa 1860-1920) was an Edinburgh architect who output included schools, churches and public houses. References from previous list description: City of Edinburgh Archive, Dean of Guild, 23 Jan 1896, South Back of Canongate. Town Plans of Edinburgh (1876-7) and 1893-4).